Diana Chepkemoi won the women’s title after breasting the tape in 2:51:34. Yego was followed by Francis Bowen of Elgeo Marakwet in 2:19:03 while De Clark Omari of Nyamira clocked 2:19:08 to seal the podium places. Isaac Ngeno (2:21:01), Afred Maisiba (2:21:06), Steve Kibomet (2:21:21), Abedinego Ombori (2:21:42), Jalius Kilimo (2:22:05), George Achulla (2:23:25) and Isaac Timbwol (2:23:33) completed the top 10 places. Yego said he at one time feared he would not make it due to the high humidity but realised his opponents were equally hurting and decided to chase his dream, although in a slow time. “I am a happy that, despite being a closely contested race, I managed to beat my opponents to retain my tittle,” said Yego, who has also run in Valencia, South Korea and China. However, the race was nearly thrown into disarray as two athletes tried to cheat their way to the top but only had their names struck off the participants list and results annulled. Teresia Omosia from Nyamira County took the women’s silver medal in 2:52:35, as Hellen Wanjiku from Nairobi claimed the bronze in 2:52:53. Rebecca Chepsang from Eldoret and Sheila Kiplagat from Nandi clocked 2:53:42 and 2:56:40 to finish fourth and fifth respectively. Doris Monda from Nyamira and Irene Mogaka from Kisii came in the sixth and seventh after timing 2:57:03 and 2:57:47 respectively. Chepkemoi she was grateful for winning such a tough race in punishing conditions. Siaya County runners dominated the 10km led by Ezekiel Odiwuor, who timed 30:58.00. Joseph Okello and John Bosco came second and third in respective times of 32:36.38 and 32:37.39 . Kisumu’s County Johnstone Omondi and his counterpart Donald Omondi also made it to the top five in respective times of 33:52.00 and 34:26.00. 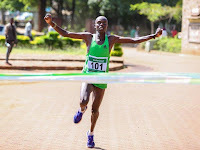 Lewnnida Agatha from Migori County won the women’s category in 38:37:00 ahead of Agnes Atieno (46:47.00) and Esther Akinyi (54:56.00) .